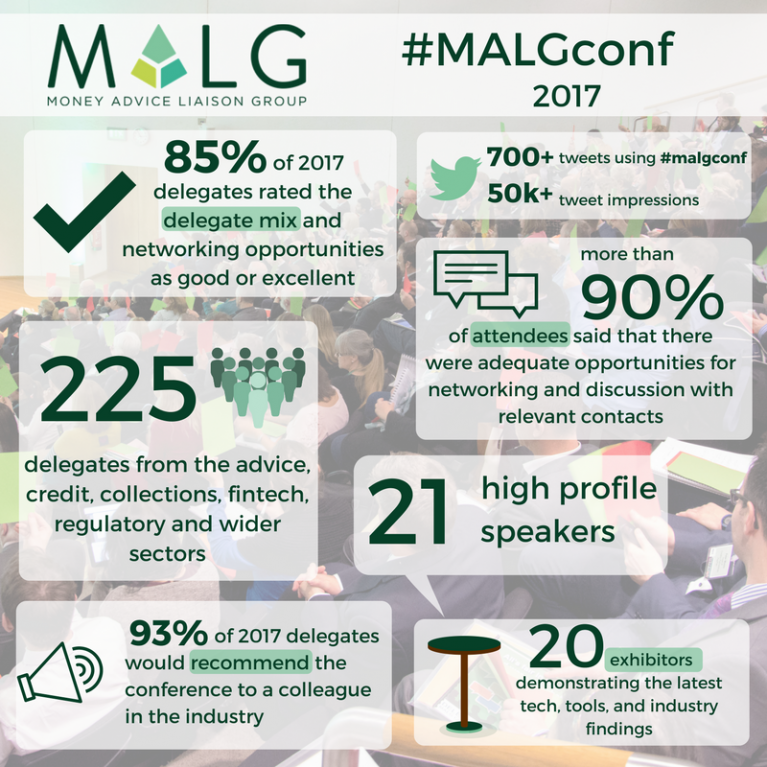 The Money Advice Liaison Group (MALG) Conference on Monday 27th November 2017 at 30 Euston Square, London, was all about ‘Shaping the future of money advice’. The speakers and sessions were well received on the day but the discussion and debate doesn’t stop here! We will be organising follow up working groups and meetings to take some of what was discussed on the day to the next stage as part of our aim of ‘working together to improve the lives of people in debt’. The exhibition at the MALG Conference 2017 was different to any other. Rather than an opportunity to ’sell’ to delegates who are there to learn as opposed to buy, exhibitors added real value by interactively demonstrating a cutting-edge piece of technology or kit, or launching a new piece of research. Liz Barclay Opening Speech MALG 2017 from Bob Winnington on Vimeo. Emma Stone Keynote Speech MALG 2017 from Bob Winnington on Vimeo. MALG Conference 2017 – Bruce Davis Keynote Speech on the social life of money from Bob Winnington on Vimeo. High Cost Credit Panel MALG 2017 from Bob Winnington on Vimeo. Alex Lewis and Chris Fitch MALG2017 from Bob Winnington on Vimeo. Closing Speech MALG 2017 from Bob Winnington on Vimeo. 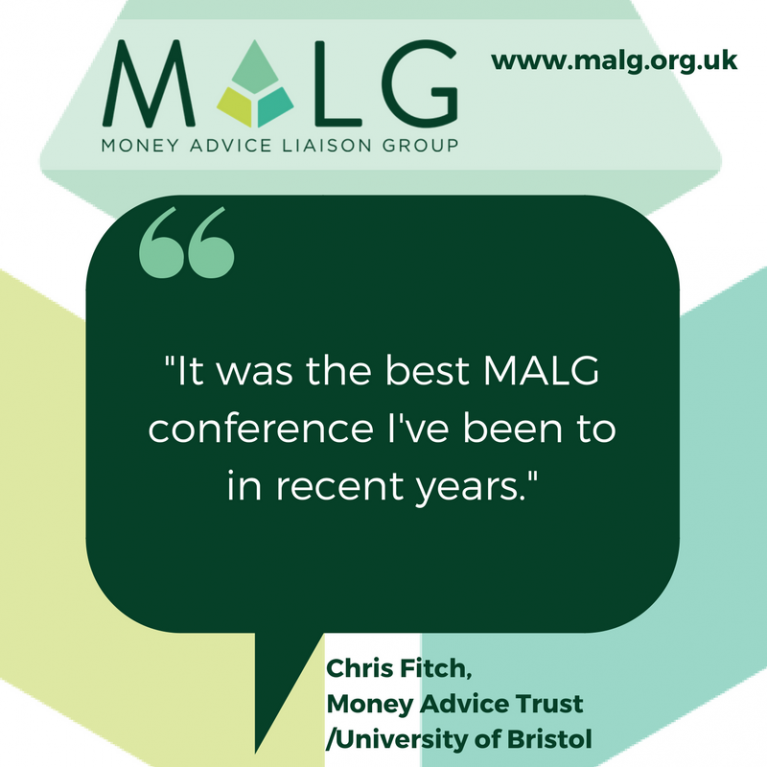 Download the MALG Conference 2017 programme.